You and I both know how demanding it is to be an attorney; deadlines for motions, court dates, EBT’s, conferences –you name it. So it’s understandable that you simply don’t have enough time to learn SEO extensively. This doesn’t mean that you can’t take some time out to learn the basics –and by doing so, save yourself thousands of dollars in wasted fees to web designers and seo “specialists” who don’t tow the line. Oh, and let’s not forget to mention the loss of who knows how many potential new clients you could have sitting in front of you, if your site wasn’t showing up in Timbuktu! To that end, peruse the following “quicky prep course” of what mistakes to avoid when hiring a web designer or SEO, and find your way out of the woods!! 1. 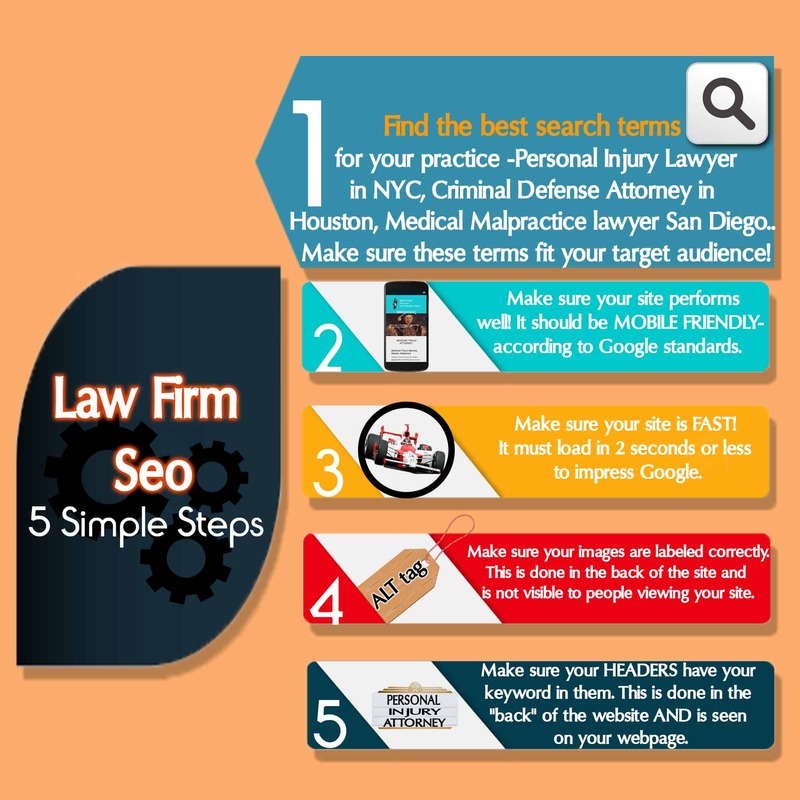 Law Firms Hire Web Designers That Are Clueless at SEO! Lawyers often hire big firms to do their web design and seo, and frankly, some of those companies probably don’t give a damn about you or your website, as long as they get paid. Yes, some of them know how to make attractive websites – which is totally worthless if those websites are hard to find in a Google search. Some of the bigger lawyer web design companies and search engine optimization specialists also farm out work overseas to people whose first language isn’t even English, and that isn’t even the worst of it! Some of these overseas seo companies use “black hat” seo techniques that can irreparably harm your standing with the search engines. You need to hire an SEO Specialist you can trust! Oftentimes website construction is overlooked in favor of design. For example, a web designer may see fit to put a video with a large file size at the top of your homepage or in the slider. This can cause your website to load seconds slower. Remember, Google takes speed into account as part of the user experience. A well constructed website means that all your ducks are in order, without gaping errors such as slow loading images or broken links. It means having a website that loads in 2 seconds or less and is mobile responsive, according to Google standards. 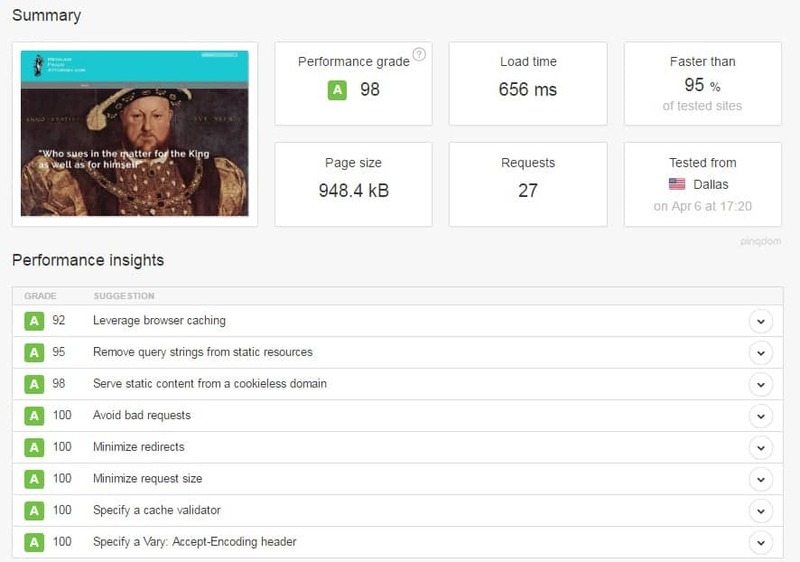 Below is an example of the scores this site achieved on a website performance test. Remember, having a high performance website greatly improves your chances of showing up higher in the search results. Keyword research, in a nutshell, is finding the most searched for terms in your niche. A law firm website created without keyword research in mind is dead in the water, as far as search results are concerned. Before beginning work on your website, your web designer should thoroughly interview you as to the type of law you practice and your target audience. A quality interview should remind you of, well, an EBT! The desired result from this EBW ( Examination Before Website) would be to come up with specific search terms that people use when searching for a lawyer in you niche. For example, if you are a personal injury attorney, you need to know what people who are looking for a personal injury attorney actually type in the search bar when they search. 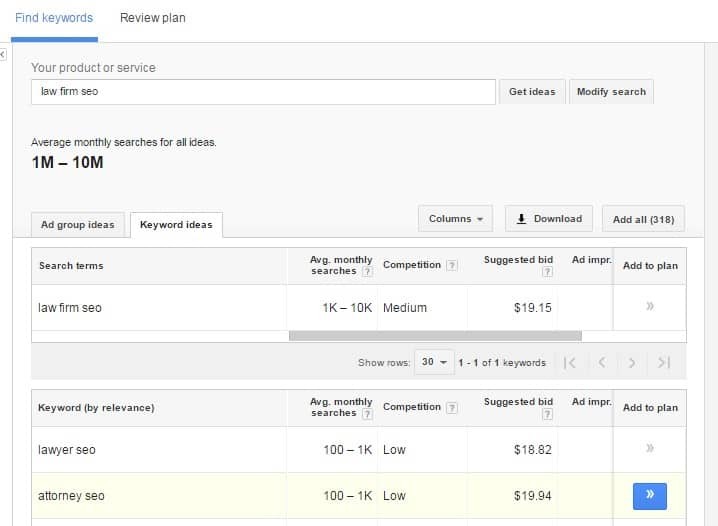 You should also know how many people search for this term each month, and how high your competition is for that search term. Once your web designer or seo finds out the most searched for terms that apply to your practice, they will want to exploit these by creating compelling content from ideas that emanate from these terms. This content should be used for your web pages, as well as your blog, and should be socially shareable. The key phrase being “socially shareable” because this sharing has a two pronged benefit: it gets your firm more exposure to potential clients, and it raises the chances that others with legal websites or blogs will want to create backlinks to your site. Backlinks send a message to the search engines that others find your content valuable enough to include it in their websites. Below is an example of a blog post from a personal injury law firm that got 2.9K social shares on platforms such as Facebook, Linkedin and Twitter. These web designers, or so called seo’s, often mislabel images and sometimes don’t even label them at all. What does this mean, in plain English? It means you’ve lost a golden opportunity to show a Google Bot that is reading your site –what your site is about. The more times and the more clearly you can show Google what your website is about, the better your chances are of getting ranked for those keywords. The biggest goof I see with lawyers’ websites is that they don’t use their keyword properly in the headers. What does this mean, in plain English? A lawyer with a local, specialized practice, for example, a personal injury attorney in Sonoma County, should use this keyword phrase in their headers, aka, titles on their web pages. Instead, I see lawyers using the names of their firms in the page headers. Yikes!! I mean, it’s ok if you’re Coca Cola, but if you a local attorney who wants prospective clients in your area to find you, your headers better have your keyword. In summation, hiring a web designer inexperienced at search engine optimization will cost you more in several ways; you will have to hire a seo specialist at some point for damage control, and the time it takes you to realize your site isn’t showing up where it should could be costing you new clients. People doing a Google search will rarely look past page one, and virtually never past page two. So, if you are a personal injury attorney in Sonoma County, for example, and your website shows up on page 3 or later for that search term, you’ll want to consult with a seo troubleshooter to see what the problem is and how to get it fixed. Want a Blog Article for Your Website or Need Help with SEO? This article was written by Philip Mann, owner of iDesignYours. We are a web design firm specializing in search engine optimization for attorneys and local businesses.